Have you ever watched your dog sleeping and they start twitching, making little mewing noises or even barking or howling? It’s probably during a dream they are having. Dogs have very similar sleep patterns to humans including the stages of wakefulness, rapid eye movement, or REM and the last stage of non-REM. The running in their sleep and jerking movements are during the REM part of their sleep. And guess what they are dreaming about? YOU! Dogs are replaying their favorite part of their day, including things they remember about you; your face, your smell and how you reacted to things they did. The important thing is not to wake them up. 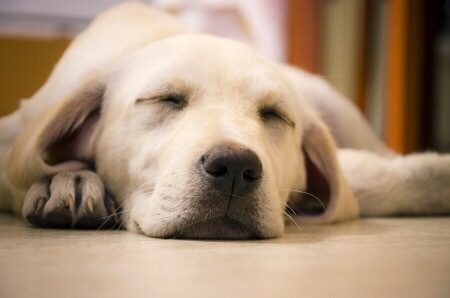 Dogs need deep, uninterrupted sleep even though they sleep as much as 18 hours a day. Just let sleeping dogs lie! Our dog is a shelter dog, and they had no idea his background. The saddest thing was that he would get nightmares and cry while he slept! Although now he is a lot better, he still does it once in a while. I always wonder what he dreams about. Our dog Bristol was about 1 1/2.years old when we adopted him. He was underweight and always guarded his food even though he wasn’t a foodie at all. He had terrible dreams and we always wondered what he was thinking about. Glad you adopted a shelter dog too!